Second Semi final of CLT20 2014 has been played between Kings XI Punjab and Chennai Super Kings at Rajiv Gandhi Stadium, Hyderabad. Chennai once again hold nerves in very important match and down Punjab by huge margins of 65 runs and gracefully enter in CLT20 final of 2014. DJ Bravo declared man of the match for his superb inning of 67 runs of just 39 balls. Earlier, Punjab won the toss and put Chennai into bat first. 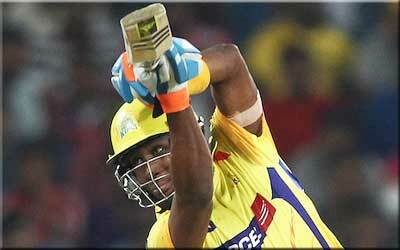 Chennai top order could not bated well and lost 3 wickets in 41 runs. F du Plessis and DJ Bravo plated good cricket and kept wickets in hand upto 14th overs. F du Plessis made 46 runs of 33 balls and DJ Bravo played superb inning of 67 runs of just 39 balls with 3 massive sixes and 7 fantastic fours. RA Jadeja in later overs played quick inning of 27 runs of 13 balls and put Chennai on 182 runs at the end of 20 overs. Following huge target of 183 runs in very important match, Punjab lost V Sehwag for a duck very early. Next coming batsman WP saha also departed scoring just 6 runs and put Punjab into trouble. GJ Maxwell also gone for duck of 4 balls. Manan Vohra could not carried his inning for long and got out scoring 16 runs. Punjab lost 4 wickets early in 5.3 overs. At half way of inning Punjab were 57 for lost of 6 wickets. Lower and middle order batsmen tried their their lavel best but, Punjab team all out scoring 117 runs in 18.2 overs and lost the match by 65 runs. DJ Bravo declared man of the match for his superb inning of 67 runs of just 39 balls.